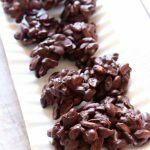 Slow Cooker Dark Chocolate Peanut Clusters–homemade chocolate covered peanuts clusters that are made at home in your slow cooker with just 3 simple ingredients. Are you candied out yet from all the leftover Halloween candy? 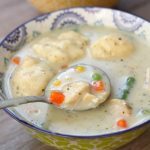 I hope not because I have a great “recipe” for you today. 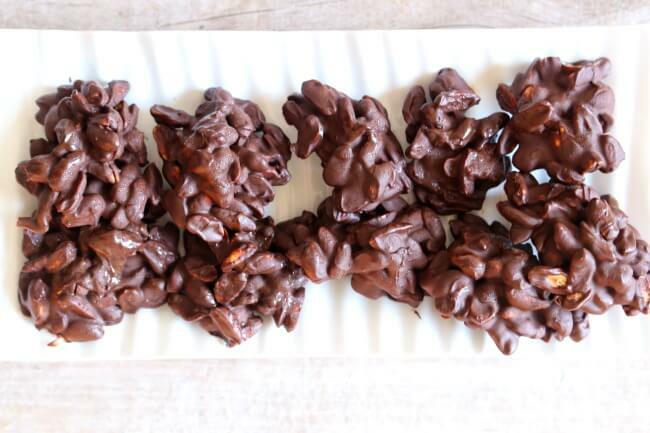 I put the word recipe in quotes because these slow cooker dark chocolate peanut clusters are so easy they aren’t really even a recipe. You know what I noticed from my kids Halloween candy bags? They didn’t get a lot of candy that is made with dark chocolate. There are Junior Mints, York Peppermint Patties and Milky Way Darks but other than that it’s pretty much all milk chocolate. I’m not a huge fan of milk chocolate but it will do in a pinch. You know what else I noticed? You don’t really see Mr. Goodbar’s except at Halloween. You know Mr. Goodbar right? He’s packaged in yellow wrapping and the red text? It’s a milk chocolate candy bar with peanuts in it. That’s sort of what these slow cooker dark chocolate peanut clusters remind me of…except way better. The dark chocolate bumps it up a notch for sure. Can I just tell you something that I don’t think a lot of people know? Hershey’s Special Dark Chocolate Chips are really good chocolate chips. Now, I don’t really like regular Hershey’s chocolate chips–they’re too sweet. But the Special Dark are really really good. They’re creamy and taste great alone or in cookies. I buy mine at Walmart for about $2.50 a bag. I am a chocolate chip connoisseur so trust me. I also really like the Kirkland Brand at Costco and of course semi sweet Guittard and Ghirardelli. I’ve also heard that the Trader Joe’s brand is good, although I haven’t tried them myself. Slow Cooker Chocolate Chip Cookie Bars–perfect for those of you who like the crusty pieces and who like the middle soft pieces. Slow Cooker Mini Peanut Butter Cup Cheesecake–Gah…need I say more? Slow Cooker Rhubarb Strawberry Cobbler–Only 4 ingredients! Slow Cooker Nutella Brownie Pudding–Decadent and perfect for chocolate lovers. Slow Cooker Salted Caramel Hot Chocolate–A holiday favorite! Slow Cooker Cinnamon Candied Almonds –Perfect neighbor gift for Christmas. Slow Cooker Hot Fudge Brownie Cake–Tried and true! 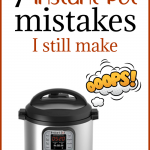 For this recipe I like to use a small slow cooker–my 3 quart Hamilton Beach slow cooker. 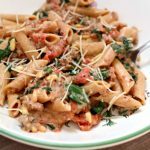 If you have a 2 or 3 quart slow cooker you should definitely use that for this recipe. If you don’t and just have a large 6 quart slow cooker I would insert some sort of oven safe dish inside the slow cooker and melt the chocolate in that. I have a pyrex dish or a corningware dish that both fit into my large crockpot. That way the chocolate will melt more gently. 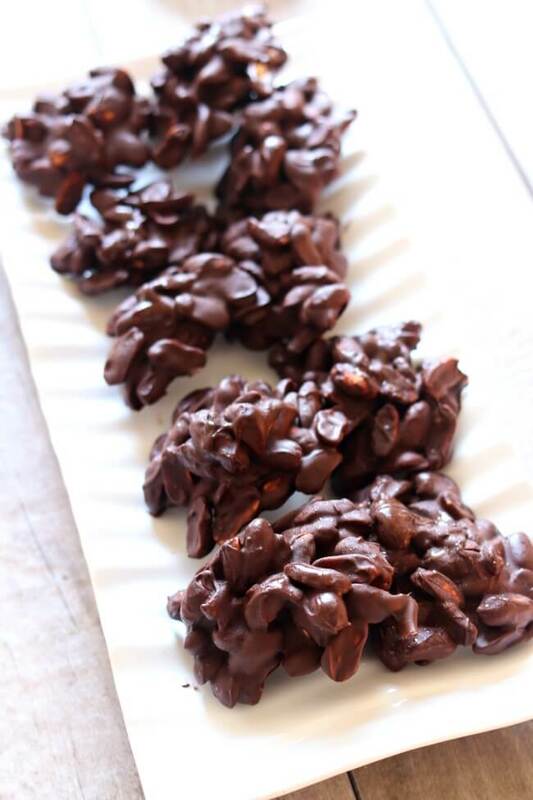 Homemade chocolate covered peanuts clusters that are made at home in your slow cooker with just 3 simple ingredients. Dump the peanuts into the bottom of a small 2-3 quart slow cooker. 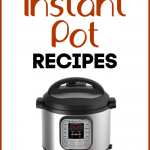 If you don’t have a small slow cooker find an oven safe dish that will fit inside your large slow cooker and place the peanuts in that and then place the dish in the bottom of your large slow cooker. Dump the chocolate chips into the slow cooker on top of the peanuts. Add in the shortening. Cover the slow cooker and cook on LOW for 30 minutes to 1 hour (this time will depend on your slow cooker. Mine took exactly one hour. Yours may take 30 minutes or up to 90 minutes). Stir the chocolate, it should be all melted. Cover the peanuts totally with the chocolate. Get out a piece of parchment paper or waxed paper. Spoon clusters of peanuts/chocolate onto the parchment paper. Let the chocolate dry and then enjoy. To speed up the drying process you can place the clusters into the fridge or freezer. Store leftovers in an airtight container. *This post contains affiliate links for Amazon. Each time you purchase something from Amazon that I’ve linked to I get a few pennies. Thanks so much for supporting my blog! 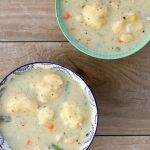 Could you double or triple the amounts and cook them in a large slow cooker? 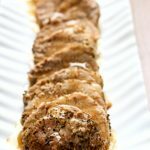 have been making this recipe for most of my life. It really doesn’t get ant easier than this. Once in a while I’ll use milk chocolate. What does the shortening do? Can I make these without it? Can l use coconut oil instead of shortening? I’m really unsure on how that would turn out. I’m not that familiar with coconut oil. You could try it and see! Why can’t we use butter instead of shortening ? Do not use butter or margarine because both of these contain water, which can ruin the melting process. This recipe sounds great for the holidays. Your email link is not working. It took me to the turkey meatballs. I had to manually come to your blog to find it.